Fume Extractors with Hepa Filters and Activated Carbon Filters to provide Air Purification in Laboratory, Pharmaceutical, Medical, Manufacturing, and Industrial Facilities. 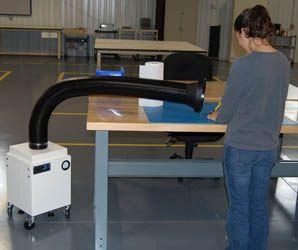 The Model 300 Portable Fume Extractor is a source-capture fume and particulate removal system. Featuring heavy-duty casters and 5" diameter flame-retardant, self-supportive flex arm, this unit pulls up to 350 CFM of contaminated air through the filter chamber before recirculating cleaner air back into the workspace. Filter options include HEPA, ULPA, ASHRAE, and Activated Carbon. 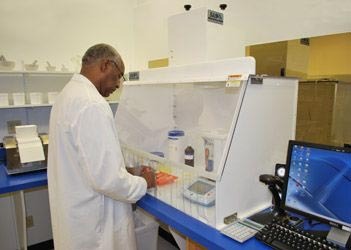 Markets served include laboratory, pharmaceutical, medical, manufacturing, and industrial facilities. 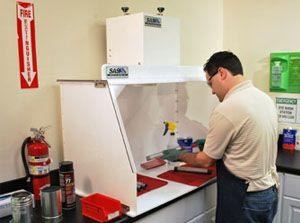 We manufacture a quiet and compact line of patented air cleaners offering simple and unique air quality solutions for many laboratory, pharmaceutical, welding, soldering, and manufacturing operations. 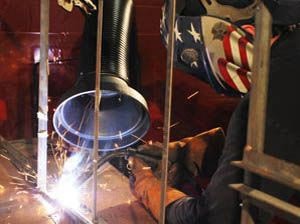 Our fume extractors are proudly built in the United States under the most stringent quality control measures. We offer several types of filter media for your applications which include: Hepa Filters,ULPA Filters, Carbon Filters, Acid Gas Filters, and various other specialty blended filters. 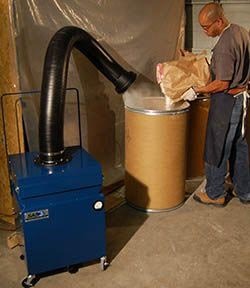 extraction, powder extraction, and various other applications that require a compact yet highly sturdy fume extractor. The 300 series units are mid-sized yet extremely portable. 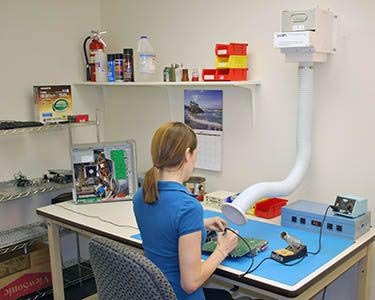 Utilizing a small amount of space these powerful fume extraction systems also combine HEPA Filters, ULPA Filters, Carbon Filters, Acid Gas Filters, and various other specialty blended filters. 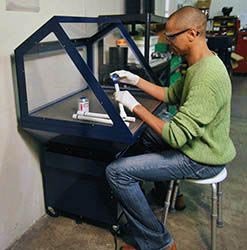 From portable fume extractors to tabletop systems, the 300 series offers a variety of configuration options for welding fumes, powder extraction, pharmaceutical compounding, solvent fume extraction, and many other applications. The 400 & 450 series units are designed for high flow fume extraction. This powerful line is slightly larger then the 300 models and has correspondingly higher airflow and filter capacity. An extremely durable, quiet, and economical line that is also modular to fit your needs. 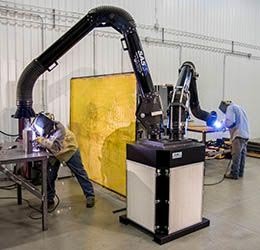 Typical applications addressed by the 400 series include: welding fume extraction, light grinding dust, powder extraction, solvent fume extraction, and a variety of applications involving chemical fumes and dusts. The model 400 also utilizes HEPA Filters, Carbon Filters, Acid Gas Filters, and various other specialty blended filters.